Today we welcome guest blogger, fashionable friend and fellow Francophile Priscilla Pilon of Weekend in Paris who recently returned from Ireland where she visited, among other Irish enclaves, Newport’s sister city, Kinsale. Though she experienced amazing restaurants, rich culture and history, plus warm (and legendary) Irish hospitality, she also made some time to visit some of my favorite Kinsale shopping sites and discovered a few of her own. With Newport Irish History Month kicking off next week, it’s the perfect time to feature Priscilla’s adventures! Take it away, Priscilla! I was delighted to be sent on a mission by Trivago.com, the place where all the hotel bookings sites are put into one place, to check out hotels, food, wine and shopping in Newport’s twin city, Kinsale, Ireland. This historic fishing port is considered one of the most picturesque, popular and fashionable resorts of the south-west coast of the Emerald Isle. Authentic Irish Linens: Granny’s Bottom Drawer specializes in embroidered linen pillows, baby bibs and Christening robes, pajamas for men and women, blouses, lined skirts and tops. They also feature cotton and linen placemats, napkins, tablecloths and runners. 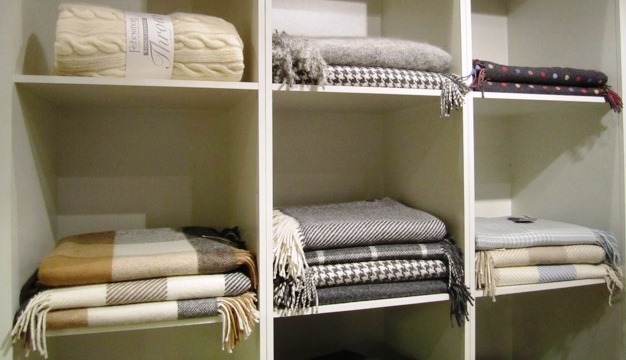 Irish knit throws, scarves, sweaters, and capes are the most stylish items they carry. The owners of Granny’s sources their stock from local Irish vendors. Glass: Cocktails are back in vogue, serving them in beautiful crystal makes magic. 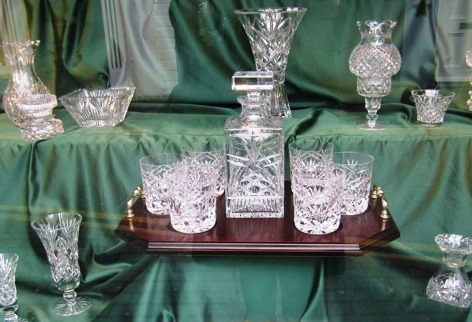 Kinsale Glassworks has a shop in the heart of the town with a workroom in the back where you can witness the craftsmen cutting the crystal into perfect receptacles. Oh so Mad Men! 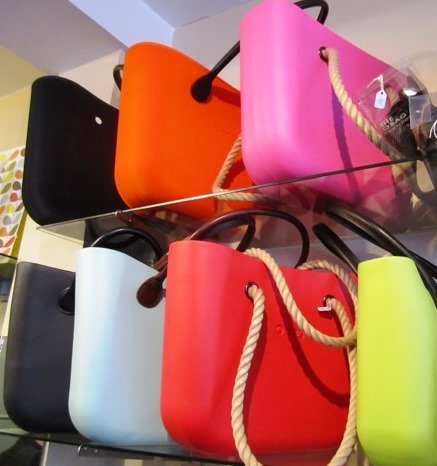 Shopping and Weekend Bags: Hamish, Hawkin & Co Interiors and Collectables sells Europe’s most unique city and shopping bags called The O Bag, designed by Emanuele Magenta, and made in Italy by Fullspot. These colorful bags are lightweight, and come with a choice of interchangeable handles in high quality leather, faux leather and rope. Cool accessories include inner zip-up canvas bags, woolen and fur trims (faux fox and faux mink) which dress up the simple designs. 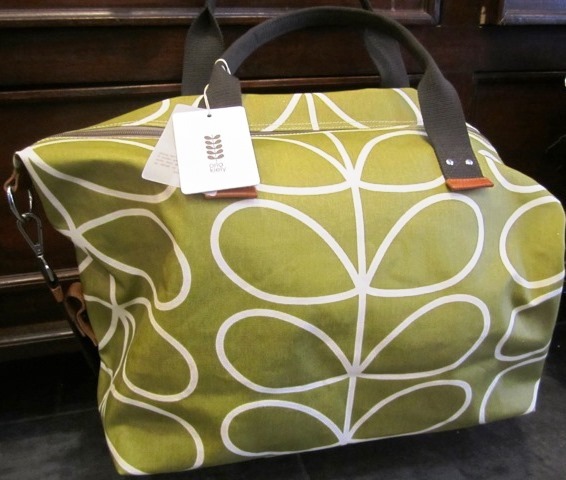 Print, laminate Orla Kiely overnight bags are also sold at Hamish Hawkin. These practical but adorable weekenders fit everything you will need for a short trip to someplace fun! Choose from retro olive, modern dusk or classic black. 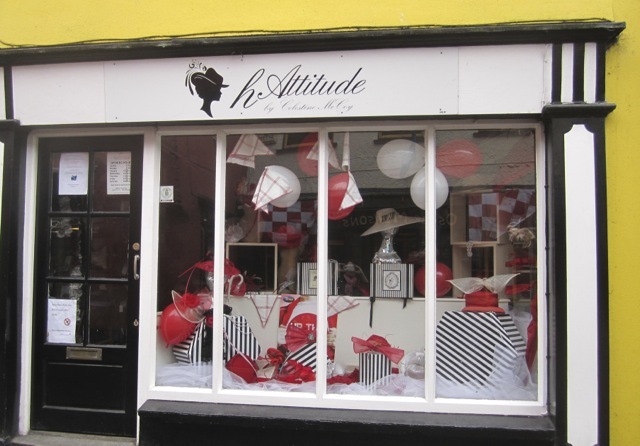 Hats: Hattitude is the name of County Cork’s best shop for ladies’ bespoke hats, fascinators and headwear. Celestine McCoy is the milliner extraordinaire who will take you through the shapes and styles that suit you best. She will also assist you in matching colors and feathers for your special day. Why don’t we ladies wear more hats in Newport? If Hattitude was in Newport, I bet we would! Beach Décor: Our two cities love a shop where we can find beach themed accessories for our homes. Kinsale has a lovely shop called Cronins that carries one-of-a-kind objets d’art, gifts and housewares, perfect for seaside homes. Watercolor prints, wooden sailboats, rustic drift wood signs and seashell candles just some of the goodies to be found at Cronins. Entry filed under: TRAVEL, Uncategorized. Tags: Actons hotel kinsale Ireland, Authentic Irish Linens, Celestine McCoy, county cork, Cronins kinsale Ireland, Emanuele Magenta, European shopping bags, Granny’s Bottom Drawer kinsale Ireland, Hamish, Hamish Hawkin, Hattitude kinsale Ireland, Hawkin & Co Interiors and Collectables, Ireland travel, Irish crystal, Irish Milliner, Irish style, kinsale, Kinsale app, Kinsale Glassworks Ireland, kinsale Ireland, Mad men glassware, nautical style, Newport ri, Newport ri boutiques, newport ri shopping, Newport ri sister cities, Newport ri twin cities, Orla Kiely, The O Bag, The O Bag by Emanuele Magenta, Trivago, trivago.com. We went to Kinsale as well and loved it! The sister city to Newport, RI so of course it’s awesome!! !